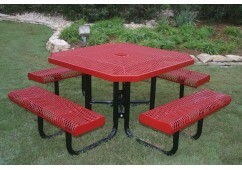 When you’re shopping for coated metal picnic tables, don’t be fooled by appearances. Many of our outdoor metal tables are coated with plastisol or polyethylene and boast bright, beautiful colors, so at first glance, you might not even guess that the tabletops and seats are made of metal. Explore the top-quality outdoor metal picnic tables we have for sale and you’re sure to find the one that’s right for you. We offer quick shipping on most products and custom orders are encouraged, so contact us now for a free quote! 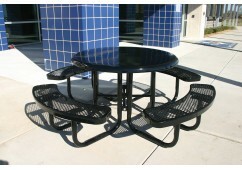 You can buy tables in many different sizes and have them delivered to your commercial or residential location. Smaller models boast a table height of 20 inches and a seat height of 12 inches, which makes them very accessible to children. Other metal tables for sale here are available in both adult and children’s sizes, so you can get matching tables in a height of both 31 inches and 24 inches, for instance. Some metal tables come in varying lengths as well. Occasionally, it might be necessary to move a picnic table to a different location: Perhaps a picnicker wants to move the table into the shade or bring it closer to other tables. Check the descriptions of our tables to determine their size, weight, and portability. In some locations, you might prefer that the table be permanently fixed to the ground. For example, some tables are intended to remain under a shelter or near playground equipment. For many of our metal picnic tables, you have the option to purchase mounting hardware to secure the table to a cement pad. 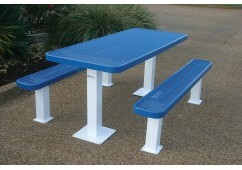 The perforated design of picnic table metal is a popular choice, as it allows moisture, wind, and dirt to pass through. This style can be eye-catching and fun! However, we also carry some tables with surfaces made of solid metal, which makes them better for writing or drawing on. Then, you’ll need to consider the type of coating you select for the table surface, which can make the surface appear either glossy or matte. When evaluating your surface texture choices, consider who will be using the table, what types of activities they will use it for, and the best methods for keeping the table clean. In order to keep your metal picnic table safe, follow the care and maintenance instructions provided by the manufacturer. Periodically inspect the table for any damage caused by weather conditions and use. If you have secured the table to a cement pad, make sure the mountings are secure. Clean the table after each use to preserve its beauty. Provide good lighting around the area, and put the table into storage during extended periods of non-use to prevent graffiti. 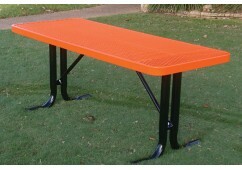 Outdoor metal picnic tables can be useful in parks, schools, playgrounds, and other places where children and adults get together for picnics and recreation. Their bright colors are inviting and complement the colors often found in play areas. In addition, seats can be removed from some models to make them accessible by wheelchair. 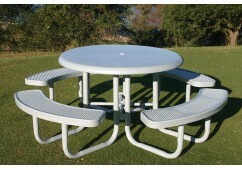 Browse the options available from PlaygroundEquipment.com and find the right outdoor metal tables for your space!